Recently, as I was taking a break from writing this blog post, I decided to go to Facebook. Little did I know that my visit there would change the complete beginning and outline for this post. I was on Facebook reading a post of one of my friends where she was asking her friends what they thought about her adding another monkey to her life and there it was, a comment that had put my true thoughts into words. She is one of my highly respected monkey friends and we both share in common that we have both added many different monkeys throughout our lives. For years, if someone called today for me to take their monkey and I was guided to bring their monkey into my troop, I would feel this way for myself. But, if someone had asked me about them getting another monkey I would start asking questions and then tell them my opinion about how it might work out for them. So, I will give you my reason for taking this well known, respected. monkey caregiver’s words and to begin to agree with them. If you are thinking about adding a monkey, then you already know what it is going to take from you to have another one. You have had the experience of being a monkey caregiver and although you may not have raised a monkey, but you would understand when you might be saying ‘yes’ or ‘no’. It seems so amazing to me that I have not spoken these words before when speaking to people that wish to ask questions and get reassurance about adding another monkey into their life. It can and will all work out because when you allow peace to guide you to the right choice and then through it, the pathway will lead you always to where you are suppose to be. You may be the stepping stone for the monkey that comes to you to find his/her perfect home, or it may turn out that you are the forever home for the monkey. I feel that every monkey is a special gift and I wish to be loving and open enough to know that they are where they are suppose to be either with me or with another family. If you know that it works out this way, then chances are that you are already listening and choosing to follow that all important voice of peace. 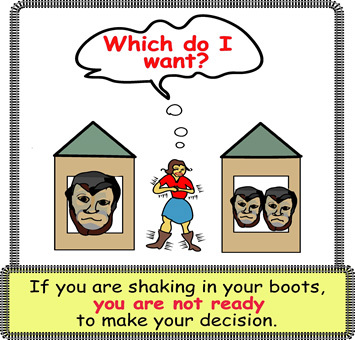 I know that this sounds to many of you readers as much too easy while others might be having feelings of indecisiveness and fear. You might be saying, “This type of thinking does not work for me! I need someone to reassure me and help me make my decisions.” There could be some saying, “If I get a new monkey, it will stay with me forever! I could never part with it.” Well, I totally understand these last statements because I also used to feel the same way too. For those of you who are in this place of non-peace. I would like to say, “I am sorry that this is happening to you. Let’s hope you may find the next part very helpful, I know that I did.” In order, for me to find the kind of peace that I am talking about, I had to start by changing my beliefs. I had to give up the belief that I was in the role of God in all of my decisions and also to begin letting go of the belief that I had to make it work out with each and every monkey that came to me. This is when I had to realize that I needed to start listening for the voice of peace in all of my decisions. I did not need to follow such unrealistic beliefs anymore either. I did not know that my pathway with my beloved monkeys was going to lead me where I am today. However, I did know that I would have more monkeys than just one due to offering my teacher a home for his monkeys when he passed away. It was so odd how I just started receiving monkeys after my teacher’s monkeys came. Of course, due to all these monkeys coming, I began having many experiences of adding monkeys into my troop. It was very hard at first because I loved everyone of them and I wanted to keep them forever. But, with a few of them I started to realize that the most loving thing to do was to search for what I felt would be the best possible situation for them based upon their individual special needs. 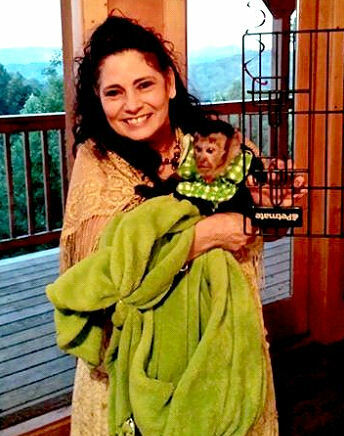 By choosing to be this type of monkey caregiver I was able to find forever homes and wonderful monkey caregivers who turned out to love the monkeys too. These types of experiences are what helped me to change my beliefs and to begin to listen for peace to come into my decision making processes. If you have fear about spending the money, for a new baby monkey or opening your heart and home to a re-homed monkey is overwhelming you so much that you are standing in your boots shacking, I do understand. There are many of us experienced monkey caregivers who have been in this same place. It simply means that you are not ready to make a decision. I like to call it fence post sitting. While you are doing this fence post sitting, you need to fix the problem that is causing the lack of peace – or you need to back away from the decision. I would like to share a story that may help you understand a little better about the issues that I have just talked about. 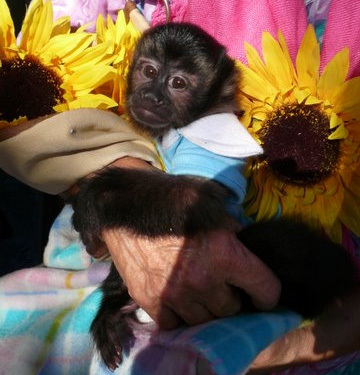 Around three and a half years ago I received a call from a gentleman that I had worked with for several weeks when he first received his baby monkey. He was very sad when he told me that he was going to need to place his little Casper in a new home. He wanted to know if I knew of anyone that would like to have him for a certain amount of money. I told him that I would love to have him but that I felt that Bob (my husband) would kill me if I spent the money or added a monkey right now. I told him that I would check to see if I knew of anyone that might like to have him. Two weeks later he called to see if I had been able to find a home for his Casper. I told him that I had checked with several people that I knew and that I had not been able to come up with a home for him as of yet. He then told me that he just did not feel comfortable with anyone but me having him and that if I could come and pick him up that he would be mine. I wondered, why did I say ‘yes’ so fast without even asking Bob first. I knew that I had worries such as, how was Silly Willy going to accept another monkey into his world and this time it would be a boy. I was worried that he and Casper would not get along and then I started thinking about the other monkeys in my troop, how would they do with another boy coming. My worries were building faster and faster but at the moment when I could have either said “yes or no,” I felt peaceful to say “yes.” As I was trying to get back to peace, I began to figured out that the real problem with my decision was because of my feelings of guilt. I had not including Bob in my decision making process and I knew there was a good chance that he was going to be upset with me for doing this too! So, I was relieved when that was over but I still had to drive to a very unbelievable place called New York City! I felt that it would be best to ask my good friend Danny Covington to help me drive there. I was totally in shock when he said to me, “Don’t worry about this, Mary Lynn. I will drive up and get him so you will not have to leave your monkeys.” I was so thankful for his good hearted nature and his desire to help the owner get his monkey safely to a new home. Danny coordinated his travel arrangements with the owner of the monkey, and then Lisa his wife and I helped to get his car ready for the long trip up and the long trip back with Casper. It was really amazing how the plans all came together so very fast. I remember thinking that it was so meant for me to get that little boy because things do not happen like this if it is not one of those suppose to happen things. Excitement mixed with peace was overflowing everywhere within me. SunShine MonkeyShines was opening our home once again to another monkey and this one had been started out using my programming techniques. I was so thankful for the owner’s trust and desire for me to have his Casper. It was a very hard decision for his owner to make but we both knew with his life changes that it was the loving thing to do for Casper. He wanted to give him a chance to be around other monkeys and have a loving family. Lisa was in touch with Danny throughout the entire trip. She knew he was by himself and that he had planned to drive straight up and meet the owner and his family, load Casper in the travel cage and then leave the city. The calls back and forth made all of us feel better about his trip. He thought that he might be able to drive up and back but as it turned out he did decide to stop and get a room for some much needed rest for himself and Casper. The next day when he called to tell Lisa he was back on the road again, he also told her about his night of sleep and the time that he had with Casper. She told us that he had taken the cage into the room and put it beside his bed on the bed side table and opened up the cage and he came right out to him, but when he tried to change his diaper, he let him know instantly that he was not going to let him do that. He was very concerned that he had not been able to change his diaper but he decided that it was best to not stress him out by insisting the diaper be changed. Lisa and I were so excited to hear every word from Danny and Casper and how their trip home was going. We were both eager for them to arrive. We kept looking at the photos that his owner had sent of Casper as our excitement grew. Every now and then one of us was looking over at the clock. The time seemed to be clicking by so slowly. We were all so relieved when Danny and Casper finally arrived. It was wonderful to have them home and off of the road and it was amazing to finally see the little Casper. For a little monkey who had never taken a trip in a car; he had really passed with flying colors. Danny had done an amazing thing by making the trip up and all the way into New York City and then back home. I said a quick hello to Casper and looked into his cute little face and then I went over and gave Danny a big hug and thanked him. It was so much fun listening to his trip stories about Casper’s family and home. As I was continuing to listen to Danny’s stories of his trip, I decided to get the bath water ready in the sink and get everything ready to get him out of the travel cage. After the wash water was ready and I had everything just right for Caspers first bath in my kitchen, I walked over to the cage. He came right out to me and he was such a good boy and let me take off his diaper and then give him a bath. He totally loved his bath and I let him stay in it until he was ready to get out. I dried him with the warm air of my blowing heater and as I was drying him I remember how pleased I was that he did not mind me touching him all over with the towel to dry him. I reached for the diaper and within a few moments I had him re-diapered. Lisa put some nice goodies for him to enjoy in his new cage while I was getting him cleaned up and ready to get some food and have some time in his new cage. I was being such a good boy here in my home and I was more than pleased with our new little guy. We decoded to take Caspers equipment that was around his neck off and then put him into his waist belt so that I would be able to quickly click a lead onto his belt. He was not completely happy with us doing these things but he did allow us to finally get these things completely finished. I stepped over to the cage that Lisa had ready for him and then motioned for him to go into the cage. Suddenly he turned on me like a light switch had been turned on. He was acting like Dr. Jekyll and Mr. Hyde and not only did he hurt me physically but he also hurt my feelings. I cried as I was trying to get him into the cage and away from my hands and arms. I had to be big and use all of my tools, in order, to get control of him enough to get his diaper off and him into the cage. All of us were obviously shocked that this had happened. We were not prepared for Casper’s display of anger and aggression that he had shown towards me. For a moment or two no one spoke. We were in total shock that Casper had shown himself to be such a gentle natured monkey and then in the next moment had shown us to be such a hateful natured monkey. I knew that I needed to call the previous owner and let him know that Danny had made it to my home but I knew I needed to wait so that I would be settled emotionally when I called him. As I reached for the phone I knew the call was going to be a hard call to make but I knew I needed to tell him gently about what had happened. He was very pleased to hear that Danny and Casper had made it home and that Casper had been bathed and was now in his new cage. He said to me, “Well, how did you like his behavior? I knew that I had to tell him about Casper’s actions changing when I started to put him into his new cage. He was very concerned and very surprised but I assured him that he did not need to worry and that I would keep him posted on how he was doing in the days to come. We all agreed that Casper needed time to adjust to his new life. He apologized to me several times and I tried to let him know that everything was fine here again and then we said, good-bye. This display of anger did not stop with Casper. He would not let me put his food into the cage cups without using his hands and nails to grab and hurt me. The only thing that gave me hope was he did allow me to change his blankets and then rub his head with my hands when I opened the door on his cage. Casper was the only monkey that I had ever had this type of problem with. Usually a monkey is always nice to the person that feeds them. One day, I knew it was time to try again so I got him out of the cage and gave him a much needed bath and put his diaper on once again as I had done before when he had first come to me. He was so perfect acting in every possible way. I was happy he was doing so wonderfully that I decided to hold him in my arms and take him to the monkey room to meet the other monkeys and then all around the house. I remember taking him also into my bedroom and watching him enjoy his exploring time while he was in my room on his long lead. We had such a wonderful time together. I was happy that I finally was able to get him out and have some fun with him. I had been told by the previous owner when we talked the second time after Casper had arrived that he had also acted in the same way to his wife when she fed him in his cage. I truly felt that since we had finally had some wonderful bonding time together that Casper’s behavior at feeding time would be a thing of the past. He played and explored for a long time but finally it was time to put him back into the cage so I took his diaper off without any problem and then his long lead. When I opened the door for him to go inside his cage, the moment that he understood that he was going back into the cage, the same thing happened all over again. I was hurt by Casper once again and this time it was just as bad as the first time. I was so thankful that I was able to get him back into the cage since I was in the house by myself. After this second display of anger and aggressive behavior, I knew I had to make my decision about keeping Casper here with us and the other monkeys. I knew that I could not allow my other precious monkeys to see this type of behavior towards me that Casper was displaying. As much as I loved him and wanted to be the right person to have him, I knew that I had to face the facts. Casper needed to leave my home immediately because I could not ever again allow Silly Willy or Pixie to see this type of aggressive behavior acted out in front of them. I knew when adding monkeys into your life that there are never guarantees that it will work out (in the way that I dream or wish it to work out) so I cried out my feelings of sadness and regret. I went through all of the things that I felt that I had done incorrectly where Casper was concerned but in the end I had to follow the peaceful guidance. I knew that Casper was meant to come to me but now I also knew that he was not meant to stay with me and the other monkeys. I can’t remember just how I asked Danny and Lisa if they wanted to take Casper home with them but I found the courage to do it that very same day that Casper took his frustrations and anger out on me for a second time. Danny had put so much time and effort into making us have a successful transition from New York City to Tennessee with Casper and because of this, I felt they might have a wonderful connection if given a chance. Tiki, who was Danny and Lisa’s only monkey definitely needed a buddy to play and have fun with too. So, I felt that Danny might be the key to the solution due to him being a strong alpha monkey caregiver in his home with Tiki. Casper had been a man’s monkey before he came to me, therefore I had great hope that he would feel right at home with Danny and Lisa. I was dedicated to Casper finding love and happiness, so I knew these good friends of mine were perfect for the job and I was at peace about him going to live with the three of them. Tiki – Silly Willy’s ½ brother, and the boys will be 9 years old the same week in July. Happiness and appreciation was overflowing with me when they both said, “Yes, Mary Lynn we will take him.” The transition was better because Casper loved and respected Danny instantly. He was able to do everything with him that needed to be done: baths, diapering, feeding, holding him, playing ball and really having fun with him. I knew within a few days that Casper had found the perfect new home. It took a while for things to start working out with Lisa and Tiki but they were patient and determined to give time to the situation with Casper. Lisa and Tiki are doing wonderfully with him now and she and Danny both know that it was meant to be that he be the one to take him from his old home and be able to bring him to their home. The story ended with Casper finding love and happiness and having a new home with his new monkey buddy Tiki. What Thoughts Are Keeping You From Feeling Peaceful About Adding Another Monkey? Are you worried about spending all of the money from your income tax so that you will not have money for your vet fund? Are you worried about the monkey not bonding with you but with your spouse? Are you worried about your other monkey (or monkeys) not accepting the new monkey? Are you worried about the personality of your other monkey changing when you add the new monkey? Are you worried that you might be getting a new monkey too soon after a death in the family? Are you only getting the monkey for your other monkey and do not really wish to have two monkeys. Are you worried about rushing to get another monkey because of major changes are happening in your life? Are you worried that others are not agreeing with you about getting another monkey? Are you worried about getting another baby monkey because of your age?Are you worried about getting another baby monkey because you are not sure if a boy or a girl with work well with your other monkey? 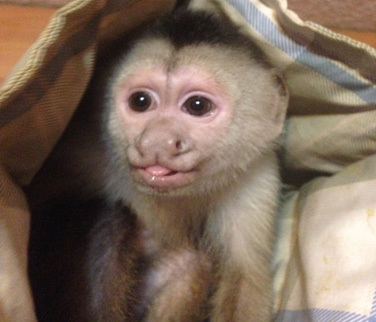 Are you fearful of adding a re-homed monkey into your home? These Are Just A Few Things Listed To Get You Started Looking Into Why You Are Not Peaceful About Adding Another Monkey Into Your Life? Only you know what they are my friends. So, let me encourage you to be brave and choose to look deeply into your dreams and desires. Please listen to yourself speak as you are telling others about your plans to get another monkey. Through listening to your own words you can become aware of your true inner feelings. Yes, you have the answers to your question about whether you should get another monkey. You have the ability to see into your own life and see what is happening to you but believe me when I say, “In the end you will see all you needed was someone to encourage you to open your eyes and to start living your life more aware of what is going on in your heart and mind. Through becoming aware of the unhealed places or the real reasons and issues that are really blocking your ability to follow the voice of peace, you will be ready to listen and then you will be able to accept the peaceful guidance. The best homes for monkeys need to be homes where the members are grounded and balanced and are healthy thinking individuals. The energy of a family that is fighting and arguing, or venting their problems on each other is not a healthy environment in which to raise a baby monkey. Monkeys are very special gifts to people’s lives when they are choosing to have them for the right reasons. When the family members do not strive to become a healthy thinking family unit, the outcome can become less than you would like it to be when a baby monkey grows older. When we are living and feeling peaceful in our day to day lives, we have proof we are listening to the highest possible guidance that is available to us. If you can truly understand this then when making big decisions, such as adding another monkey into your life, you will always know, no matter what the answer is, it will always work out. It will and always does when we seek to know that it is time to change our unworkable beliefs and choose to heal our hearts and minds and then know how to listen to that all important thing called peace. I have always felt that education is the key to helping monkeys stay in their original homes. In many cases (such as the story that I shared with you here) there are sometimes un-expected life changes that occur and many families must make big decisions about the happiness of their monkeys. There are many reasons why monkeys can be re-homed several times due to people not being the proper fit for the monkey that has come into their lives. 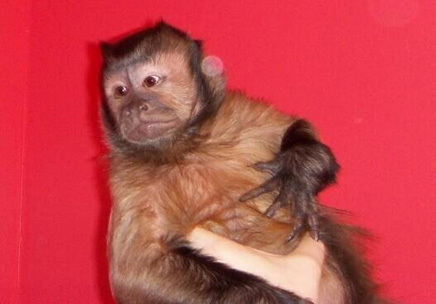 I encourage all of you that are considering taking in a re-homed monkey to learn everything possible about the monkey’s previous life before you obtain them. Education is always the key to helping us be successful with the monkeys that come to us. I have learned many of my lessons the hard way. Help was not as plentiful as it is now so remember to listen and learn as I do also when it comes to living with our monkeys. It is impossible for any of us to experience everything that can happen with monkeys so remember one day you might be called upon to teach what you have learned too. I wish you only happy times as you are living with your monkey or monkeys! Thank you for visiting us here at Primate Care. We are committed to bringing good information for you to think about and share with your family, friends, and other monkey caregivers. In the next posting on the Primate Care site we will be speaking about “What it is like to live with a nutty monkey”.